How does the Fukushima Daiichi meltdown disaster show the enormous risk potential for the continued operation of the Diablo Canyon atomic reactor? Filmed by Ecological Options Network (EON) at Point Reyes Station in California, Fairewinds Chief Engineer Arnie Gundersen presents A World in Danger. This presentation from the 2015 California speaking tour precedes a panel discussion “Tell All” between chief engineer Arnie Gundersen, Fairewinds founder and president Maggie Gundersen, and EON co-directors Jim Heddle and Mary Beth Brangan. The follow-up conversation can be found here. Fairewinds just submitted its comment to the United States Department of Energy regarding its "Consent based siting" process. Should you decide to comment, learn more here. Comments are due Sunday, July 31. Fairewinds Energy Education Comments on "Consent Based Nuclear Siting"
“Consent based siting” is the process proposed by the Department of Energy (DOE) to locate radioactive waste dump sites around the US. Fairewinds Energy Education believes that such a process is biased against communities struggling financially due to factory closings and the global economy. Choosing an atomic waste dump is tempting to towns and villages so anxious to increase short term income and economic survival that they are willing to sacrifice long-term environmental damage in return for that income. At its heart, the consent based process is an environmental justice violation as well as a DOE method to avoid finding an appropriate scientifically viable site to dump by foisting it on impoverished citizens who will not mount a protest. Nuclear waste remains toxic for tens of thousands of years. The consent based siting proposed by the DOE lures currently underemployed citizens to commit their hometown community for hundreds of future generations of potential genetic damage in return for a short term income gain to a few individuals, who own that land. 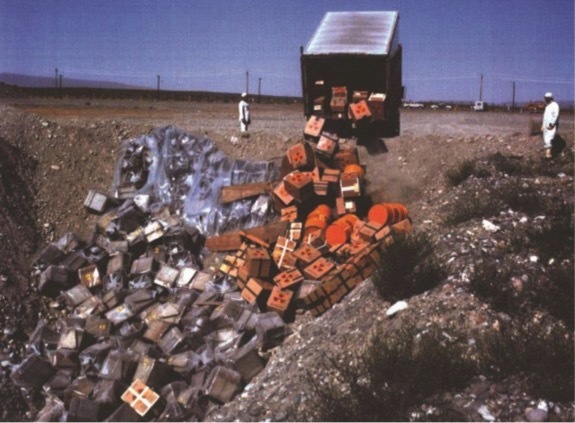 While atomic power reactors have left all of us with mountains of radioactive garbage that will need monitoring and special handling for hundreds, and even thousands, of years, instead the DOE must find the best waste dump location, and not just stick the waste where the fewest individuals will launch protest actions. When Litchfield County Connecticut and Orange County California have an equal chance at being chosen to be the site of a nuclear waste dump as environmentally sensitive low income counties in Texas or Native American reservations in the west, the DOE will have succeeded in optimizing its search for a waste disposal site. The current Consent Based Siting process violates the basic tenants of environmental justice. Fairewinds Energy Education has prepared this brief report in response to the EPA’s suggested changes to its Radiation Protective Action Guidelines (PAGs). Specifically, the EPA is suddenly recommending a huge increase to “allowable” public exposure levels from radiation releases caused by a mishap or disaster at an atomic reactor, waste storage site, fuel production site, etc. What does this mean? It means that the EPA is arbitrarily choosing to increase human exposure levels to atomic radiation releases without conducting an adequate scientific review and without quantifying the significant health consequences to people. Fairewinds Energy Education’s scientific review of the data has found no evidence or basis in science to allow such a health compromising transfer of risk to everyone living in the United States. Therefore, Fairewinds Energy Education strongly objects to the implementation of these proposed rule changes that will compromise public health and safety and benefit atomic corporations by allowing a significant reduction in each corporation’s mandated cleanup of costly radiation catastrophes. The EPA is proposing that levels of 500 millirem per year are acceptable in radioactively contaminated water for general public consumption and an increase to 100 millirem per year of exposure levels to pregnant women and young children. These levels far exceed EPA’s acceptable risk range for cancer causing radiation exposure levels. Let me simplify this for you and for readers of Fairewinds’ comments. If implemented, this proposed change in radiation guidelines greatly increase radiation exposure to people to a totally unacceptable radiation risk level. At the same time, the changes will reduce radiation disaster cleanup costs to corporations and transfer that horrific risk and cost of cleanup to states, cities, towns, and villages that will already be suffering astronomical losses. Since the triple meltdown at Fukushima Daiichi and its decimation of much of the Fukushima Prefecture (state) due to extensive ongoing radiation releases, Fairewinds’ Chief Engineer Arnie Gundersen has traveled to Japan three times on public speaking and scientific fact finding research and analysis. Most recently, Mr. Gundersen spent one month in Japan in February of 2016 measuring the ongoing radioactive releases from the atomic disaster, and interviewing numerous “survivors”, who have been exposed to radioactive releases from the meltdowns and are continuing to be exposed to the ongoing buildup and movement of significant amounts of radioactivity. Mr. Gundersen has two degrees in Nuclear Engineering and more than 44-years of atomic energy operations and risk analysis experience. A thorough review by Fairewinds of the evidence collected and the available published literature proves that the proposed changes to the PAGs are a convoluted attempt to shift excessive radiation risks to a population of innocent bystanders at the same time the EPA is transferring excessive profits to the corporate owners of atomic power reactors, waste storage facilities, atomic fuel producers, etc. Beginning in February of 2012, when Mr. Gundersen spoke at the Foreign Correspondents Press Club in Tokyo, he went on record stating that the economic cost of the Fukushima Daiichi cleanup would exceed a quarter of a trillion dollars ($250 Billion), and this figure does not include the mammoth health costs the government of Japan will have to cover for victims of this ongoing radioactive debacle. Instead of meeting the humanitarian needs of its people, the response by the pro-nuke Japanese government, Tokyo Electric and the IAEA (International Atomic Energy Agency – chartered by the United Nations (UN) to promote atomic power worldwide) to this ongoing radioactive tragedy has been to significantly increase allowable radiation exposures to Japanese citizens by 20 times more radiation exposure than previously allowed. The PAGs are designed to protect real people from health damaging radiation exposure, and the PAGs were serving this function as well as the regulations allowed. This change proposed by the EPA is a complete financial boondoggle that will benefit corporate profiteers while damaging the health, water, and food supplies of all Americans. The atomic power industry in Japan, the IAEA, and the Japanese government created these changes to radiation exposure guidelines in Japan in order to minimize the astronomical radiation cleanup costs from the ongoing radiation debacle caused by the three Fukushima Daiichi meltdowns. Instead of having Tokyo Electric and the Japanese government pay the costs as the regulations were originally designed, the Japanese government has transferred enormous additional radioactive risk to its own people, who are still being unwittingly exposed. Toxic illness causing radioactivity will be in Japan for centuries, and the alleged cleanup methods currently being applied are simply spreading toxic radioactivity to Japan’s once pristine agricultural community and its crucial rivers, streams, and aquifers as well as the Pacific Ocean from which it derives much of its food sources of fish and seaweed. Why is the EPA considering placing civilians at such a dramatically increased magnitude of risk? When these corporations first built their atomic reactors and other facilities, the licenses to do so were granted under the obligation that these corporations are ultimately responsible for all maintenance and cleanup. Why are corporations gaining profits while the financial risk will be borne by people in and near those reactors for hundreds and thousands of years (in the case of plutonium releases, like what happened in Japan)? The radiation measurements taken in Fukushima by Mr. Gundersen and other scientific colleagues coupled with their field interviews, shows that the proposed PAGs place American civilians at greater risk while saving American corporations hundreds of billions of dollars in cleanup costs. It is Fairewinds Energy Education’s expert opinion and conclusion that the proposed Protective Action Guidelines are not PROTECTIVE as required by federal statute and therefore should be rejected entirely. Conclusion 1. It clear then that if the new PAGs are implemented, the atomic production industries will benefit financially at the expense of human health. This change in radiation standards is in direct contradiction to the public health role set in legal statute that created the EPA. May we remind you that your statutory authority is for: “establishing generally applicable environmental standards for protection of the general environment from radioactive material”. According the National Academy of Science Biological Effects of Ionizing Radiation (BEIR VII) report, the EPA is bound by the linear non-threshold (LNT) radiation theory. BEIR VII is clear that there is no safe limit for radiation exposure and that radiation damage to civilians increases in a direct proportion to the amount of radiation they receive. The EPA proposal to increase the PAG limits 100-fold is a direct violation of BEIR VII and the governing federal statute authorizing the EPA. According to BEIR VII, Americans will receive the corresponding 100-fold increase in radiation damage if the EPA is allowed to violate federal law and implement the guideline changes it is promoting. Conclusion 2. If the EPA violates federal statute and implements the new PAG limits, radiation risk to the exposed civilian population will increase 100-fold. Circumventing the Safe Drinking Water Act, Superfund cleanup levels, and EPA’s history of limiting the allowable risk of cancer to 1 in a million people exposed, is a clear breach of the National Environmental Policy Act (NEPA) of 1969 (Public Law 91-190, approved Jan. 1, 1970, 83 Stat. 855), that pertains to ecological systems. It appears that the EPA proposed changes to the PAGs are based on the erroneous assumption, also held by the Nuclear Regulatory Commission (NRC), that the meltdown at Three Mile Island (TMI) did not increase cancers in the surrounding area or in those who were victims of the disaster. The peer reviewed analysis by epidemiologist Dr. Steve Wing showed that people exposed to radiation from TMI meltdown suffered meaningful increases in cancers. “Exposure to high doses of radiation shortly after the nuclear accident at Three Mile Island may have increased cancer among Pennsylvanians downwind of the plant, scientists at the University of North Carolina at Chapel Hill say. Dr. Steven Wing, associate professor of epidemiology at the UNC-CH School of Public Health, led a study of cancer cases within 10 miles of the facility from 1975 to 1985. He and colleagues conclude that following the March 28, 1979 accident, lung cancer and leukemia rates were two to 10 times higher downwind of the Three Mile Island reactor than upwind. Conclusion 3. Peer reviewed scientific evidence indicates that nuclear disasters and toxic radioactive releases, such as the Three Mile Island meltdown, cause cancer. It is a complete mischaracterization of federal radiation dose standards for the EPA to suggest that increasing the PAGs 100-fold will have no deleterious impact on public health when toxic radioactive releases happen. The proposed changes to the PAGs appear to be based upon the erroneous assumption, also misstated by the Nuclear Regulatory Commission (NRC), that there was no increase in cancer as a result of the tragic Chernobyl meltdown. According to the peer reviewed analysis of Dr. Alexey Yablokov and others, the people exposed to radiation discharges by the Chernobyl catastrophe experienced a statistical increase in cancer. “It concludes that based on records now available, some 985,000 people died, mainly of cancer, as a result of the Chernobyl accident [catastrophe]. That is between when the accident [meltdown] occurred in 1986 and 2004. More deaths, it projects, will follow. Conclusion 4. Peer reviewed scientific evidence clearly indicates that nuclear disasters like Chernobyl cause cancer. The EPA suggestion that increasing the PAGs 100-fold will have no deleterious effects on public health is a complete mischaracterization of federal radiation dose standards. Fairewinds own evidence-based scientific research in Fukushima Prefecture indicates that there will be between 100,000 and 1,000,000 additional cancers in Japan as a result of the world’s most recent atomic reactor meltdowns. As delineated earlier in this submission, the Japanese government has unilaterally increased its allegedly allowable radiation exposures to humans by 20 times, putting its entire population, and especially women and children at significant risk for developing additional cancers from these intense radiation exposures. 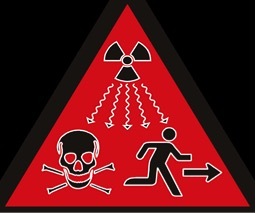 The analysis conducted by Fairewinds Energy Education and its scientific colleagues indicates the contribution from small but highly radioactive particles (hot particles) absorbed by the internal organs of exposed individuals is being totally ignored by regulatory bodies worldwide, such as the IAEA and WHO (World Health Organization). Human exposure to these small particles within internal organs exposes people to high-energy radiation for decades. The proven impact of hot particle exposure is being completely ignored by federal regulators and all international health agencies. By not considering non-uniformly distributed radioactive particles in its dose calculations, the EPA is introducing a systematic bias to its dose calculations that will create radiation-induced casualties and a humanitarian calamity. Conclusion 5. Peer reviewed scientific evidence indicates that small but highly radioactive particles are released in large quantities post-accident. The radioactive concentration in releases is not uniformly distributed. Therefore, a thorough analysis of the dose consequences from these hot particles must be ascertained before making any changes to PAG regulations. The EPA proposed changes to the PAGs absolutely underestimate the radiation induced cancers that those changes will cause to people throughout the United States while offering an enormous financial bonus to the corporation creating the risk and producing these highly radioactive liquid and gaseous discharges. Changing the PAGs decimates public health by putting the public at greater risk of radiation induced cancers while benefiting corporate profits. Acclaimed filmmaker Ivy Meeropol has unleashed her latest documentary, Indian Point, an impartial examination of New York’s highly controversial Indian Point atomic reactor. “No matter which way you come down on the nuclear power issue, watching Indian Point will clarify your thinking,” writes Kenneth Turan for the LA Times. Located in Westchester County, just north of Manhattan, the 50-mile radius surrounding Indian Point is home to more than 20 million people. That’s 6% of the entire U.S. population, according to Riverkeeper attorney Phillip Musegaas. Meeropol’s film takes us deep inside the plant as she interviews the workers whose daily job is to keep the Indian Point reactors going, as well as those advocating for the ongoing operation of the reactor. Former Nuclear Regulatory Commission (NRC) chairman Gregory Jaczko, on the other side of the argument, is touted by reviewer Kenneth Turan as the most complex and interesting character in the Indian Point film. Deeply affected by what he sees happening at Fukushima Daiichi, Jaczko makes a push to accelerate safety upgrades and better regulations at atomic power reactors in the US. Jaczko’s efforts yield aggressive resistance and bad mouthing by the nuclear power industry. Currently, available showings of the film are limited, but as the debate about our energy future and the future of aging nuclear reactors like Indian Point escalates, Meeropol’s Indian Point is a critical addition to the conversation. Indian Point owner, Entergy, has used the threat of suing New York state to gain leverage over the New York Public Service Commission’s decision as to what nuclear power plants may or may not be eligible to benefit from a $1 billion ratepayer subsidy. This subsidy provides financial aid to atomic plants struggling to remain profitable due to low natural gas prices. Originally, the Public Service Commission (PSC) proposed that only fully licensed nuclear power plants were eligible for the funding; currently, Indian Point is trying to renew its full, federal licensure. It appears that Entergy’s bullying worked now that the NY Public Service Commission has released an amended draft proposal removing requirement for full licensure. “It’s clear that Indian Point is being made eligible to participate in the program…There is no qualifying criteria such as licensing that would stand in the way,” Entergy vice president for external communications Michael Twomey, exclaimed in response to the new NY PSC draft. Greenpeace Japan has uncovered and released a report delineating radioactive contamination hundreds of times higher than pre-2011 levels in Fukushima’s riverbanks, estuaries, and waterways. Greenpeace collected 19 samples of dried sediment and soil from along the Niida, Abukuma, and Ota rivers during February and March 2016. Analyzed for the presence of cesium-134 and cesium-137, all samples but one showed levels higher than 1,000 Bq/kg of radioactive material, according to the report. The lowest level sample showed 309 Bq/kg of radioactivity. These sample results agree with the analysis of dust samples collected by Fairewinds’ Chief Engineer Arnie Gundersen during his February 2016 trip to Fukushima Prefecture. Mr. Gundersen told an interviewer for the Japanese publication Gendai Business, “What surprised me at this visit to Japan [his third since the meltdowns] is that the decontaminated area is contaminated again… This was not what I had expected. I had thought that we would not find such high doses of radiation in the decontaminated area. But, sadly, our results prove otherwise.” Fairewinds’ full analysis and report detailing the dust samples collected will be available following formal scientific publication.